Spring complete. Next up: summer ball- where we’ll learn a lot more about the 2019 Gator football team than we did today. 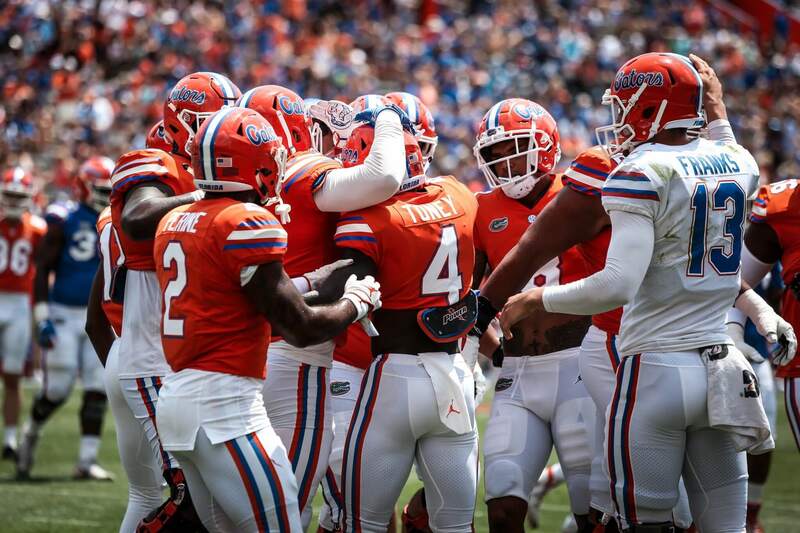 Florida’s spring football season wrapped up today with the Orange And Blue Debut, an offensive-friendly affair which the Orange team won 60-35. Feleipe Franks was the star of the day, throwing for 327 yards and four touchdowns and Team Orange. He also technically threw a pick six, a scripted move where he threw the ball right to former Gator star cornerback Lito Sheppard, who took it to the house- only a small part of the fun that took place in the Swamp. Former wide receiver Chris Doering also returned to the field to haul in a touchdown pass of his own from Nick Sproles. With nobody on the field for PATs other than the snapper, the holder and the kicker, the Orange team ran a two point conversion on air- and got it. And without the fun police patrolling the field looking for violations of people enjoying themselves, players got to partake in a wide variety of touchdown celebrations, including a game of duck-duck-goose, a Lambeau… errrr, Swamp Leap, shooting the pigskin like a basketball free throw and more. But the most fun of all had to be on the opening play, when Kadarius Toney took the ball on a trick play a heaved it down the right sideline for Feleipe Franks. That went down as a 40 yard completion, and set the stage for the fireworks to come. The truth is, fun was always going to be the theme of the day. With so many new pieces to plug in on the offensive line and Dan Mullen’s desire (which he shared with the fans) to get each of his QB’s some reps, the defense purposely played loose and gave receivers and QB’s alike plenty of room to operate with. We were never going to use this game to learn anything of value about our defensive depth chart. For example, the safeties looked pretty bad today, frequently getting “burned,” but then again that was probably by design. That will come in the summer. For the offense, though, we saw both main combatants for the 2019 quarterback job have their moments. Franks led the way, but Emory Jones did plenty to contribute to the stat book with both his legs and his arms. He did throw a pick, but he also completed six passes for 117 yards and two touchdowns to Tyrie Cleveland, as well as rushed six times for 38 yards. He also threw a beautiful deep ball to Cleveland that slipped through his fingers and probably should have been caught. As for Kyle Trask, he had a few nice moments too, albeit against a watered down defense that clearly provided him with even more space to work through than the other QB’s. He did float one across the field that had way too much hang time; John Huggins capped a fantastic spring for himself by making him pay for that, taking it back for six the other way. Trask is an easy kid to like and root for, and thus I really hate to speculate on things like this, but in the interest of keeping things real: he may soon look to transfer if he wants to play. That goes against the overall theme of the day, though. We know the Gators’ positions of concern (safety and offensive line) and we know their positions of strength (pretty much every other position). Lots of players who worked hard this spring in a proven strength and conditioning program got to relax and enjoy themselves today, and when the team reconvenes in the summer, Mullen & Co. will get to work figuring those weaknesses out.